Stonehaven Flowers boasts an extensive selection of exquisite hand-tied flower arrangements. The fresh flowers used at Stonehaven Flowers are of the finest quality, all selected by our expert florists. The beauty and longevity of the flowers used at Stonehaven flowers is guaranteed to impress. Florists Stonehaven has a collection of vibrant yellow colours whether that be the rich buttercup yellow roses or yellow spray chrysanthemums. Each bouquet is hand tied beautifully by Florists Stonehaven with the utmost skill. All bouquets from Flowers Stonehaven are handled with the care and love they deserve. Whether your order is for yourself or you have a loved one in mind, the lively yellow flowers Florist Stonehaven has to offer is perfect. Be it for a birthday gift, the gorgeous birthday vase arrangement is certain to please. The stunning colours will be guaranteed to make an outstanding impact on any room or occasion. 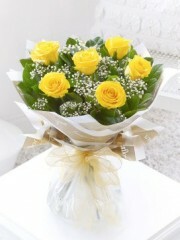 Sending a beautiful bouquet of yellow flowers from Stonehaven Flower is the ideal way to celebrate any occasion. Our wide range from our online store is sure to please, however if you decide that one of our collection is not quite what you are looking for or you would like something just that little more personal our florists are on-hand to help. The florists Stonehaven will offer guidance into what they believe will make the most fitting bouquet. The expert florists here at Stonehaven flowers are delighted to take time to prepare a bespoke arrangement for you, taking you or your loved ones preferences in mind. Each arrangement can be accompanied by some of our lovely gifts just to make it that little extra special. 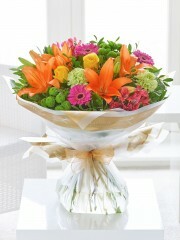 Stonehaven flowers offer a number gifts to create the most spectacular present. This may be a delicious box of our finest chocolates or one of our gorgeous bottles of fine champagnes or wines. Most of our wonderful bouquets come will a lovely vase included or perhaps you would like to have your Stonehaven flowers delivered in a marvellous gift bag. At Florists Stonehaven we wish to please and hope that you or the person you have in mind can enjoy the stunning bouquet as much as possible. Our delivery drivers at Stonehaven Flower Delivery offer a wide range of delivery option to ensure that you or your loved one gains the highest levels of satisfaction. Stonehaven Flower Delivery offers an excellent Same Day Delivery service. This fantastic service means that you can have your order delivered the same day as long as it’s ordered by 3pm that day. Flower Delivery Stonehaven also offers various slot times for you to choose from. You can select to have your Stonehaven flowers delivered before 1pm or in the afternoon after 1pm. This service is the standard Stonehaven delivery service and is offered Monday to Saturday throughout the year. The expert florists at Stonehaven Flowers offer nothing short of excellence. With the width of experience each florist at Stonehaven Flowers has you can rest assured that you or the one you have in mind will be most delighted with your order. This lovely choice of lively sunny yellow colours whether chosen from our fabulous online store or personally ordered over the phone is guaranteed to take your breath away.